Yesterday some ladies in the ward threw me a baby shower and this “cake” was one of the gifts that I received. I thought it was so cute and creative that I wanted to post some photos of it. 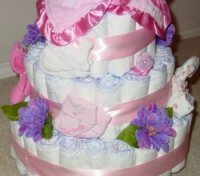 The cake has bottles of baby lotion or body wash at the core, four tiers of rolled diapers, and socks, hats, toys, and flowers pinned around the outside. Apparently these sell for $60 to $100. 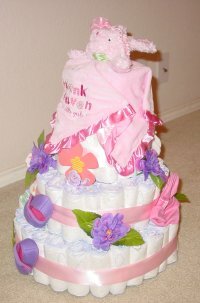 DJ told Rashae, the creator of this cake, that he would make her a website so she can sell them; he was very impressed. I wish I was creative and talented like that! 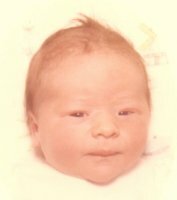 When the technician started the sonogram, the first thing he said was, “her head is certainly a lot bigger.” I told him that I didn’t want to hear that. 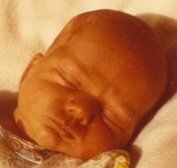 Apparently this child inherited the Anderson-large-head trait as well. The doctor said her head is measuring 37 weeks, even though I am barely 36 weeks today. Oh-well. The sonogram reconfirmed that we are definitely having a girl—even DJ and I could see it this time so we have no need to hesitate before buying anything pink! We could also clearly see the heart beating and the lungs breathing; that was really neat. Her face looked a lot more human, although the picture that they printed for us looks like a black and white blob. Now that she is so big, it is hard to see much of her on the screen at one time. It was fun to see her and very comforting to know that everything is going well. The baby is due in four weeks and we still haven’t bought anything for her. Any product recommendations that anyone has are more than welcome! 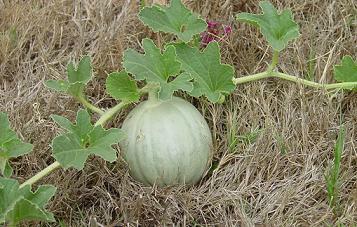 I was pleasantly surprised the other day when I went out to check on the garden and saw that I have another cantaloupe growing. After the first one was pilfered the plant was in pretty bad shape and I didn’t expect to get anything else from it, but that’s a pretty good looking melon. I would really, really like to actually eat this one, so if anyone has tips on how to keep the critters’ paws off my melon they will be most welcome. DJ started the evening by grilling steak for dinner. Yes, he cooked his own birthday dinner. 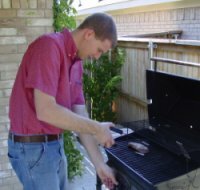 I know that is some sort of crime against humanity, but he loves grilling. Luckily, it was a beautiful day. We had a “cold front” move in and the high was a mere 91 degrees. It felt great! We were beginning to think we would never see double-digit temperatures again. After dinner it was time to open gifts. This was a long awaited moment for DJ since he picked out one of his presents and had been waiting for a very long time to use it. 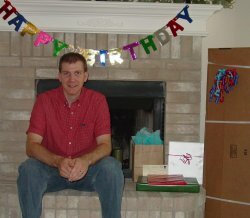 I was afraid that he wouldn’t be able to wait until his birthday, so I had to hide it after it was delivered. Finally, the big moment arrived and he got to open his guitar. 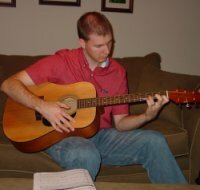 It is a Takamine 6-string acoustic guitar. One of DJ’s other gifts was a lesson book, so he immediately sat down and started figuring everything out. He tuned the strings, learned the fingerings for the first two strings, and then even played a few songs along with the accompaniment CD. I recorded video of him playing to the CD and if I can figure out how to post it, I will. After DJ wore out his finger tips, we had cake. If the cake appears rather small, that’s because it is. Since it is just the two of us, I only made half of a cake — and we are still going to have leftovers for a while. I’m sure this is completely incomprehensible to Sue, since red cake at their house has trouble even making it to the next morning. But this isn’t as good as the one she makes; this is just a Betty Crocker mix. Still, DJ pretended like it was good anyway! After dinner DJ sat down and watched the Olympics. He loves the Olympics! So all-in-all I think it turned out to be a pretty good birthday. All right, here it is. Guitar Performance. The video is terrible quality, but I think it’s cute anyway. DJ didn’t know I was recording and he didn’t approve posting it on the blog, so watch it now before it disappears! For the past several weeks we have been serenaded in the evenings by a little frog living in the pond just outside our bedroom window. It was a little loud and annoying when we were trying to go to sleep, but I didn’t do anything about it because I was always too tired by the time I was in bed and noticed the croaking. Well, the other night our little frog was joined by a friend and they decided to start a choir. By the second night I had had enough and decided that a forced removal was required. I put on some clothes, got my trusty bucket, and went frog hunting. When I turned on the back light I could see the two perpetrators sitting on the edge of the pond, singing their hearts out. One at a time I scooped them up in the bucket and, with a running start, threw them as far over the back fence as I could. I went back into the house feeling pretty good about how things went. Oh sure, I felt a little bad as I watched the frogs go flying into the darkness, but I was pretty sure they were OK. I washed my hands, got changed, and went to bed again. I told Kim how successful my excursion was and looked forward to a quiet night’s sleep. I’ll be darned if not five minutes later I started hearing frog croaks again. First one, then the second joined a couple minutes later. I’ll have to relocate them to the big lake to get rid of them for sure, but that is a job for another night. 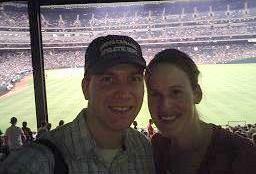 Kim and I went to our first major league baseball game last night. It’s a shame that it was our first one, considering this is the third city we have lived in with a major league team. We saw the Texas Rangers play the Toronto Blue Jays, and boy what a game it was!! The game had a little of everything. 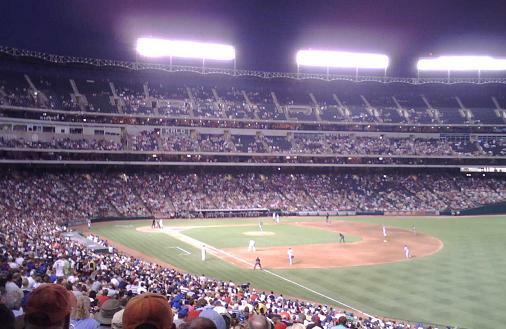 We got to our seats in the 3rd inning and the Rangers were already down 5-0. We were a little worried, but the home team kept chipping away at the lead, including a 2-run homer over the center field wall. They finally tied things up in the 7th inning. From there it was a battle to the finish. In the 8th, the catcher made a brilliant tag at home plate to preserve the tie, but the Blue Jays managed to score 2 runs in the 9th. With their backs to the wall, the Rangers came through in the clutch and scored 3 runs in the bottom of the 9th to win the game. Go Rangers!